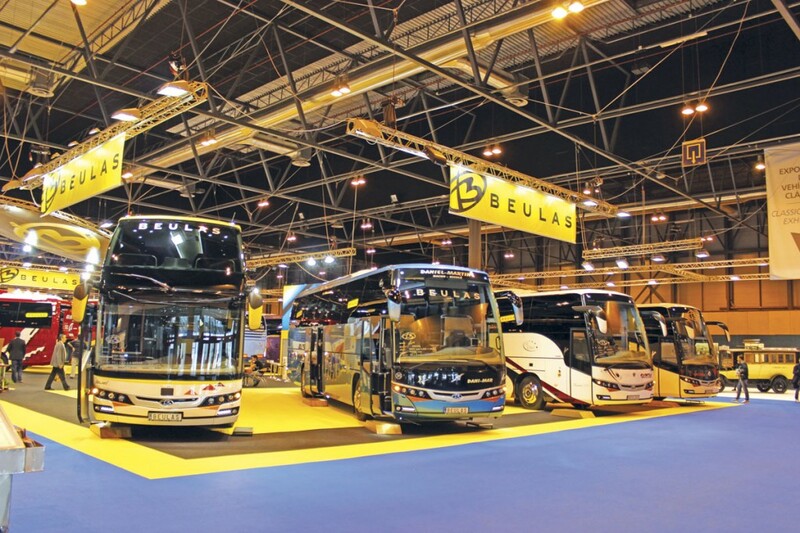 Total bus and coach registrations in Spain this year are expected to be just under 1,400 units which is a marked improvement on the 1,285 of last year but a long way from the 2,208 of as recently as 2011. Predictions for next year vary but most believe the trend is upward, a factor affecting this year having been a lack of Euro6 base vehicles to build upon as these were late coming on stream, especially in the small bus sector. This was the background to the FIAA Show staged last week in Madrid. Ayats exhibited two double deck coaches. One was a Bravo IR City open topper carrying the City Sightseeing colours. This was mounted on an Ayats chassis equipped with a Mercedes-Benz OM936 300hp Euro6 engine and Voith DIWA 854.6 transmission. It was accompanied by an Ayats Eclipse for N.R.Ruiz that was mounted on a 14.2m Scania K490EB 6×2 chassis. It seated 79 using EMAR-Kiel seats and was also equipped with a toilet. A new tie up in the UK with the associated Moseley companies was announced during the show (though not at the show) that should help the company to regain a greater share of the UK market. As is traditional, a big stand had a central hospitality area surrounded by an array of coaches on different chassis facing outwards. New was a front engined version of the Gianino small coach which was shown on a 10 tonne MAN N15 four-cylinder 220hp engined chassis, but can also be supplied on the six-cylinder 250hp powered N14. Displayed as a 27 seater with courier seat and an overall length of 7.5m, it had a tidily executed entrance with steps circumventing the engine, Kiel seats trimmed in black and red leather, a driver’s door (necessary as the driver sits in a well), and offered 4.2 cu m of luggage space. Lengths of 7.5m, 8.3m and 9.0m are available giving maximum capacities on the N14 of 27, 30 and 35 respectively within a height of 3.15m (plus air conditioning). Among other exhibits was a double deck Jewel on a high specification Euro6 Scania tri-axle chassis. A right hand drive decker was scheduled to appear in Birmingham and the Jewel will be part of the UK range. Of the nine coaches shown, no fewer than five were on Euro5 chassis, among them a Spica in Tui livery on a 12.72m Iveco EuroRider, a model once very popular in Spain but for which there is no Euro6-powered chassis equivalent. It had 59 seats and a rear continental door. Ramon Beulas told me that production would be around 220 this year, with about 100 going to Spanish customers. The company’s best seller is the 12.7m Aura, sales of which benefit from Spain allowing a GVW of 19 tonnes. He said the target in the UK was to have a presence, know that customers appreciate the product and to have a good reputation. Exactly which models would be sold was still being investigated but he hoped to be able to offer both VDL and MAN chassis. At present, the greatest demand in Spain is for the MAN. Caleche showed three minicoaches that converted to open top by means of telescopic glazed upper body sections. The Sunny was shown based on a Euro5 Sprinter 316CDi and had eight leather seats, a wood effect floor and retained the original double rear doors. The larger Panoramique is based on the Sprinter 516/519 and also retains the rear doors seating 19-22. On the 7.2-tonne Daily 70C17 chassis cab with six-speed manual transmission was the 8.47m long Sunrise Cabrio that can be supplied with 30-32 seats. Based at Manresa near Barcelona, Car-Bus is a small vehicle specialist. Alongside various coachbuilt Sprinter based minibuses for bus and coach applications was a new 6.0m long electric bus with 7.0-tonne GVW and roof mounted batteries called the Wolta. Electrified by the Italian Rampini concern using a Siemens 1PV5135-4WS14, 67kW motor developing 200Nm torque at 280A and IGBT DC/DC mono inverter, it has batteries from Winston Battery and other equipment produced by Rampini itself, including a reduction gearbox integrated within the rear axle. It carries a maximum of 22 passengers, 11 of them seated plus one wheelchair, within a width of 2.095m. There was a lot happening on the Castrosua stand and that of the closely related Vectia concern, a joint venture between Castrosua and CAF. Completely new was a city bus called the ‘City’. The show example was Scania based but it can be mounted on any diesel or CNG powered chassis, between 10.5m and 18.75m. I liked the way that the specification sheet listed ‘the pleasure of travelling’ first among its advantages. Other exhibits included a 12.92m Volvo B11R mounted Stellae coach with 55-59 Conturo Sport seats, a 12.0m City Versus body on an Iveco Citelis CNG powered chassis for 26 seated and 57 standing passengers and a Euro6 diesel powered 13m MAN RC2 mounted Magnus E body with 45 Fainsa Metropolis 3.0 seats. The City Versus Iveco was one of a large batch for Lithuania that Castrosua has supplied. A contrast was provided by the presence of a 10m 1975 Arosa body on a Pegaso 5063DR chassis. The angular styling was very reminiscent of Caetano products offered in the UK during the same period. The two integral electric hybrid buses on the Vectia stand were a Teris 10 and a Veris 12, both attractive looking full low floor city buses. Features of both include zero emission at stop, start& stop and full electric depart. Both can optionally be upgraded to partial full electric or permanent full electric drive. The Teris 10 has a 160kW system while the Veris 12 is 180kW. For all of its considerable presence at the show (16 vehicles), there was nothing on the Daimler stand, encompassing both Mercedes-Benz and Setra, that had not previously been announced at the IAA in Hanover, indeed many of the vehicles were the same ones seen there. An exception was a Sprinter City 65 low floor minibus in the colours of ALSA, a subsidiary of National Express. 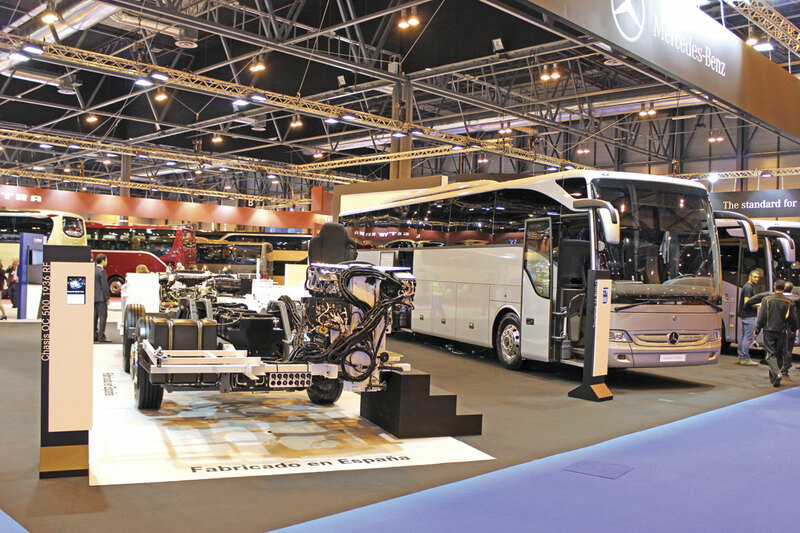 Mercedes-Benz builds its coach chassis range in Spain at Castro Urdiales and the OC500RF1936 in unbodied form appeared on the stand along with the tri-axle OC500RF2543 in the test area. The OC500RF1936 featured the 7.7-litre OM936 260kW/362hp engine and Mercedes-Benz PowerShift GO250-8 automated gearbox. Also shown were the 10.63m Citaro K, 10.32m Tourismo K, 12.98m Integro M, 14.03m Travego L, the 12.96m Tourismo 16 RHD/2 and 19-seat Sprinter Travel 45. Setra exhibits included the TopClass S516HDH and S431DT, the ComfortClass S516MD, S517HD and S519HD and the 12.2m entry level S415UL Business. Now that its longstanding relationship with Optare, from which it learned a great deal, is over, Ferqui’s presence in the UK is being strengthened markedly through the efforts of Steve Peach of Connaught. The new F5, which was scheduled to be in Birmingham, was not ready in time for Madrid. Mounted on the Atego 12.24 chassis, it will have 38 seats, around five cu m of luggage space and an overall length of 9.7m with a 4.76m wheelbase. In Spain, the Soroco is known as the Sunset S3 and a new version was shown with an extended rear overhang. Based on the Sprinter 519, the Sunset S3 Largo offers 19 seats and a 2.5cu m rear boot, giving a capacity of 3.0cu m including side lockers. Built in Macedonia, the Indbus range of small chassis cowl based accessible coaches included the Maximo M on a Sprinter 519CDI with 25 seats and the Maximo L on an Iveco Daily 70C17 that seated 29. The L had a sunken aisle. Both had lift access via a door over the rear nearside wheelarch shaped to include the wheelarch. I thought the finish around these doors disappointing and was also nearly caught out by the steeply sloping and slippery handrail as I disembarked. This year Indcar will turn over Euros17m (£13.31m) and produce 325 vehicles, 75% of them for export. Key export markets are France (30%), Italy (30%), Sweden and Norway (10%) and Germany (5%), but the hope is that with the appointment of the associated Moseley companies to sell the new Next, the UK too will become an important customer. Fourth quarter sales are being hit by a combination of a lack of chassis availability, price rises for Euro6 and the need to re-engineer for the new chassis. The main plant is in Arbucies but there is also one at Brasov in Romania which this year has produced 98 of the Mobi model. The big show news was a commercial tie up with fellow Spanish manufacturer, Castrosua, similar to that already operating with the French Vehixel concern, under which they will work together, marketing some of each other’s products within certain agreed geographic areas. Both parties will remain independent but in addition to the extended range and distribution advantages, there will also be product development, manufacturing, marketing and sales benefits. 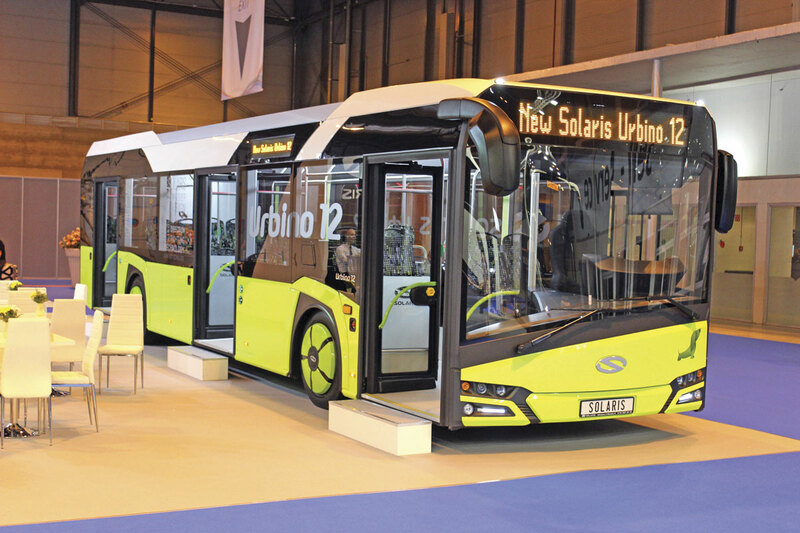 Among the results are that Castrosua will offer the newly redesigned Vehixel produced Cytios low entry bus while Indcar will offer the 12m Castrosua Stellae coach on Volvo B11R. New on the stand was the Next coach model which is 3.16m high and was also scheduled to be shown in Birmingham. Exhibited on the 12-tonne Mercedes-Benz Atego and MAN N14 12.250, it is being built for Spain on 10 and 15-tonne Iveco chassis, 10 and 12-tonne Atego and MAN 12-tonne chassis. A 14-tonne Renault Midlum based option will follow. 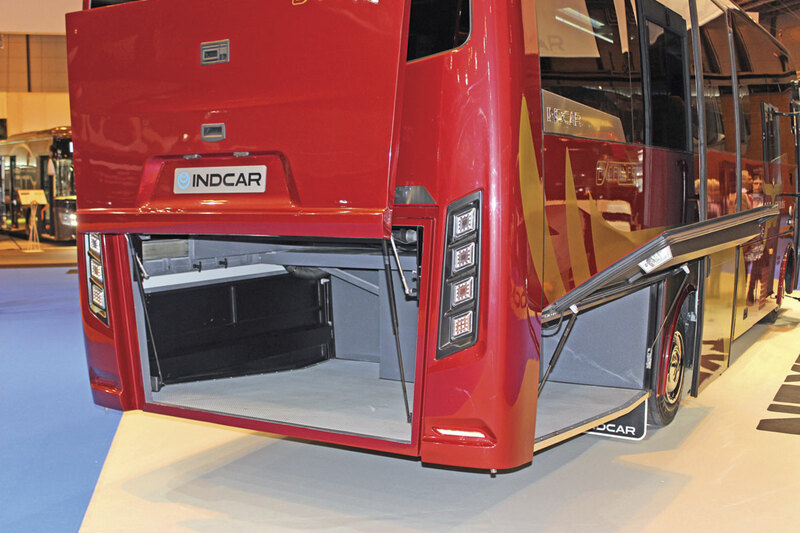 Seating capacities range from 28 to 38 seats representing a step up in the capacity range for Indcar. 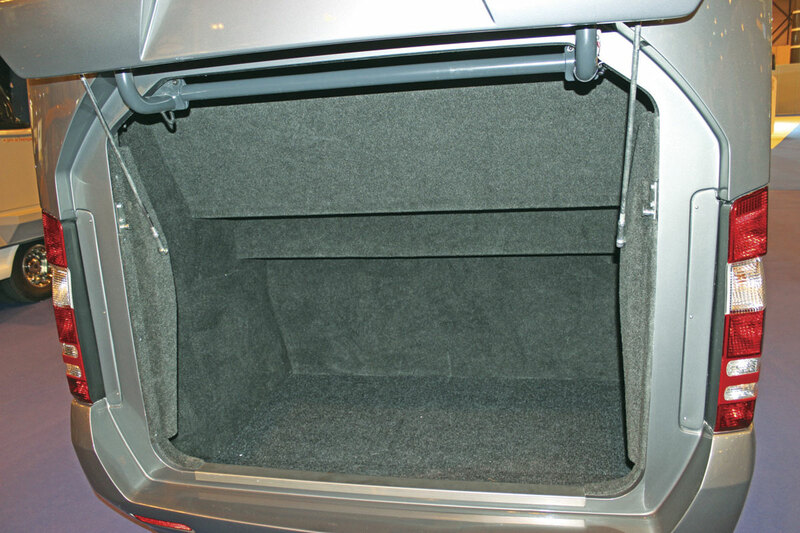 Indcar have come up with an ingenious way to maximise luggage capacity which they call the Flex-Trunk. The Next comes as standard with 7cu m capacity (including sidelockers) with 34 seats and 6cu m with 38 seats but this can be increased by 1.2cu m if two double seats are removed and a movable rear bench is repositioned. Another notable feature is a 1.15m wide combined emergency and continental door ahead of the rear axle that can incorporate a lift without compromising the luggage space available. 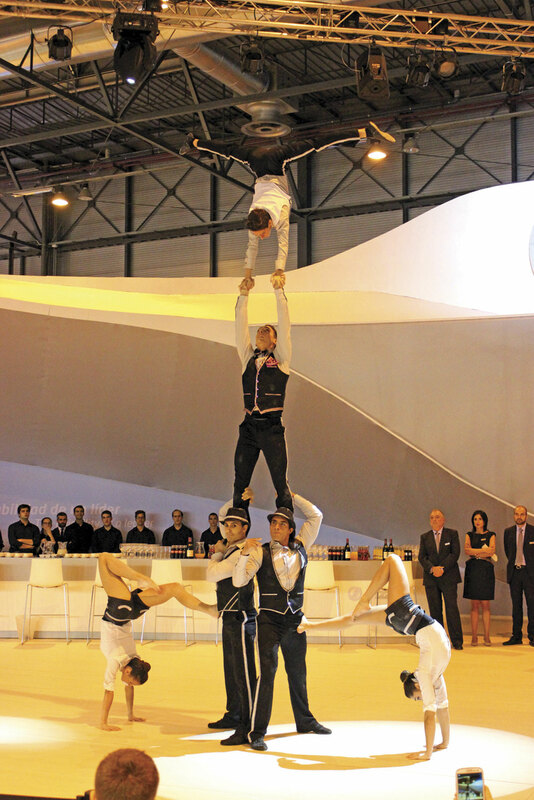 Acrobats on the Irizar stand. Celebrating no less than 125 years in business during the show, with a huge party at the Palacio Cibeles in Madrid for well over 800 guests, Irizar has grown to become the jewel of the Spanish bus and coach manufacturing crown. A vast stand was designed for acrobatic performances and hospitality as much as vehicle display with the five vehicles shown banished to the edges of the exhibition area. The spotlight was on the new i2e electric bus with Siemens Elfa-2 electric system which was launched earlier this year. At the opposite end of the stand was a line up of the four main body offerings, each on a different chassis. On an MAN RR4 26.480 chassis was a 15m PB seating 63. Next to it on a Mercedes-Benz OC500LRF1943 chassis was an i6, a 12.92m version with 55 seats. Beside this was an i4 on a Scania 410EB4x2 chassis with 55 seats and centre door wheelchair provision. Completing the parade was a Volvo B8RLE 4×2 with the i3 bus body. This seated 41 plus two wheelchairs and 33 standees and was 12.75m long. All were in metallic show liveries rather than customers’ colours. Surprisingly, especially given the number of UK operators present, there were no integrals other than the i2e displayed on the stand. Iveco has traditionally had a strong presence in Spain through its Pegaso history, though the bus manufacturing plant has now closed and the EuroRider chassis formerly built there is not being taken to Euro6 with no replacement announced. The Daily recently won the Van of the Year award. 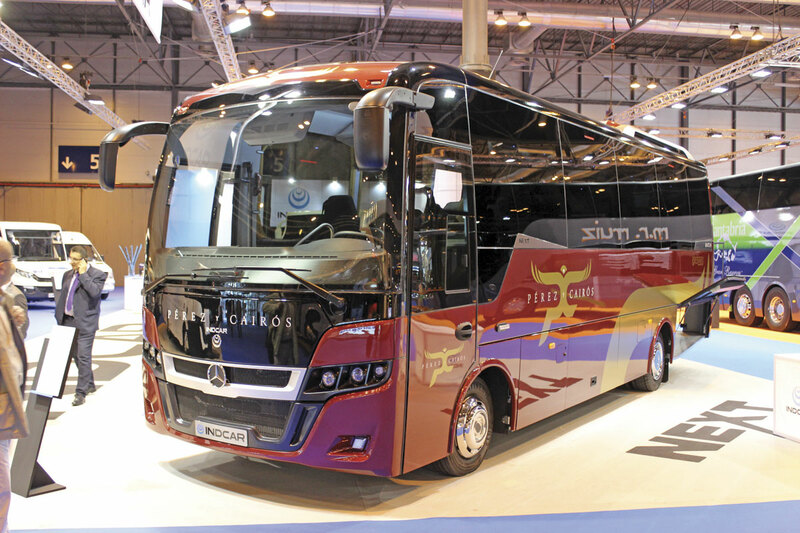 Daily coaches displayed included Iveco’s own 7.5m Daily Tourys 19-seat and three 70C17s with 7.8m Unvi Compa T, 7.7m Indcar Wing and 8.5m Ferqui Sunrise 28-seat bodies respectively. Two 12.8m long, 3.62m high, Magelys Pro coaches were shown with 59 seats plus courier and FPT Cursor 9 400hp/294kW Euro6 engines, one in white and the other in the livery of operator El Gato. 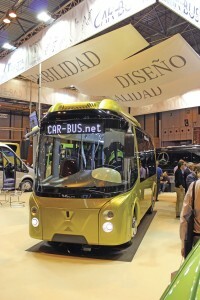 The latest generation bus product is the Urbanway. The first articulated example from an order of ten for Malaga (who are also taking 20 12m examples) appeared on the stand alongside a 13m Crossway Line. 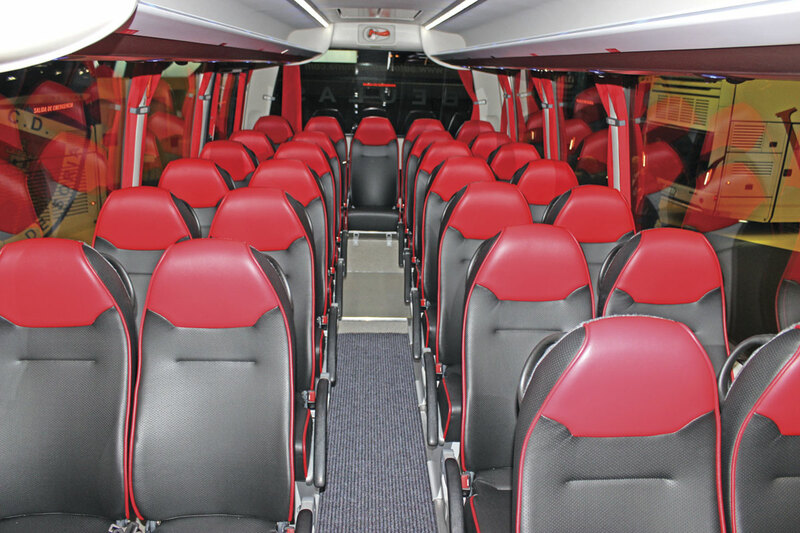 It was claimed that the Crossway is the only two axle 13m product available with 61 seats. 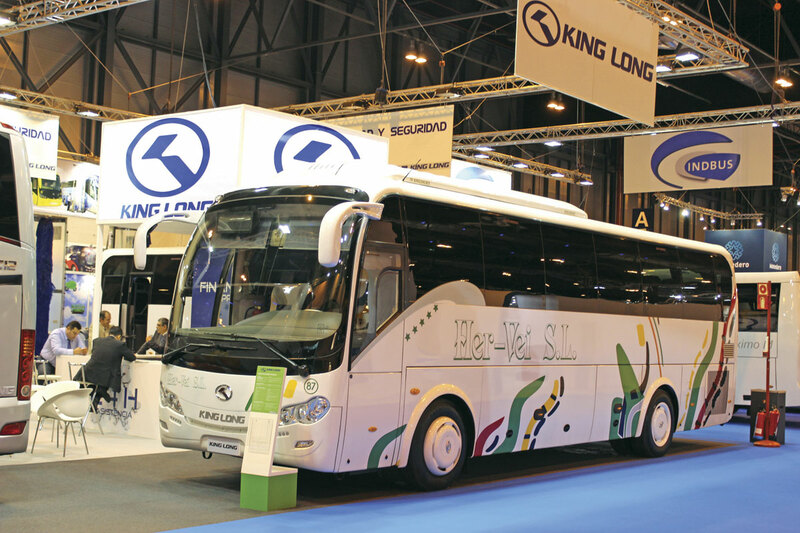 Absent from the Euro Bus Expo show, King Long was present in Madrid showing four vehicles carrying the new simpler designations. The city bus displayed was the same E12 low floor hybrid model seen at the IAA in Hanover as was the 12m C12 coach alongside it. Smaller coach models were the C9 and the Cummins ISB6.7-310 powered 9.895m C10, the latter shown in the colours of Her-Vei SL and seating 39. The first press conference of the day was staged by MAN who are currently (narrowly) the market leaders for buses and coaches above 8.0-tonnes in Spain with a share of 21.2%. They predict total market growth to around 1,600 units in 2015. 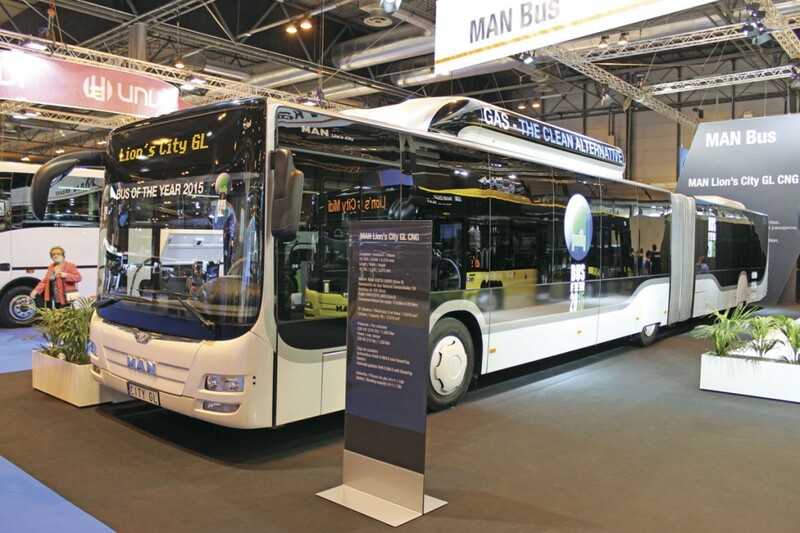 Prominent on the stand was the International Bus of the Year 2015, the MAN Lion’s City GL CNG articulated bus with five doors. 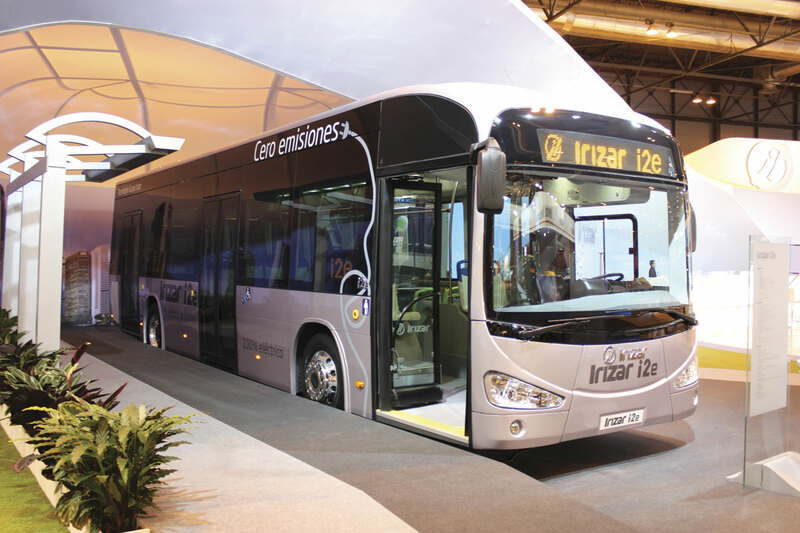 MAN has over 600 CNG fuelled buses in service in Spain so far. In addition, 40 of the 200 hybrids MAN has sold in Europe operate in Spain. An example of the Lion’s City hybrid was shown. Another bus was the 10.5m MAN Lion’s City M which can have two or three doors and accommodate up to 83 passengers. It has the D.08 engine rated at either 250hp or 280hp. Chassis products were represented by a Lion’s Chassis Efficient Line CO.26.480 chassis in tri-axle form with 480hp engine, TipMatic transmission, TPMS tyre monitoring and Alcoa alloy wheels. Despite the balance of the products on the stand, 90% of MAN’s sales in Spain are chassis mounted with only 10% complete integral products. A representative told me that little by little coach customers were moving toward complete coaches but for urban buses customers tended to stay with Spanish bodybuilders. It has been a challenging few years for Noge which went into creditor protection in 2010. A new plan for the company did not work and in 2012 the judge handling the case put it up for sale. It was bought by Sartruck, a truck bodybuilder specialising in refrigerated and bullion vehicles, based at Serinya, 20km from Girona. In July 2013 production started again as Noge Bus and the first delivery was made in the first week of September. It now employs close to 40 people at the Arbucies plant and aims to focus on profitability and productivity without getting too big. Approximately 50 coaches have been built, three of which were on the stand including the new Touring Gold, a 10.45m long face-lifted version of the Touring HD shown on a Mercedes-Benz OC500RF1936 Euro6 chassis with 39 seats. Also displayed was a 9.46m Touring H on an MAN N14 chassis with 37 seats, a rear continental door and Hispacold air conditioning. The third exhibit was a 15m Titanium with 71 seats and a vast luggage hold mounted on a Euro6 MAN RR4 26.480 with 480hp engine and 12-speed MAN/ZF TipMatic transmission. Sartruck also produces a 4×4 hybrid tourist sightseeing train combination for which brochures were displayed. With no less than six vehicles on its stand, Otokar had quite a presence. It has been selling in Spain since 2009 working with Somauto SL. Exhibits included the Cummins ISB6.7 Euro6 powered Kent C 12m three-door low floor bus seating 33 with 60 standees, Voith DIWA 864.5 four-speed automatic gearbox, ZF axles and 39kW Sutrak air conditioning. From the Vectio range were the 9.26m long, 2.35m wide, Vectio C Urban two door 25-seat + 32 standee MAN D.0836 powered Euro6 city bus; the Vectio ULE low entry interurban bus displayed complete with rear bike rack; and the Vectio T 10.1m coach with 34 seats, toilet, MAN D.0836 engine and ZF Ecolife gearbox. Another coach option is the Navigo T with Cummins ISBe-4 engine, Eaton manual box and 31 seats. Finally there was the 12.08m Territo U which now has the Cummins ISB6.7 310hp engine, ZF EcoLife transmission and a capacity of 53 seats plus 16 standees. The clicking heals of a flamenco dancer accompanied by a guitarist were frequently to be heard on the Scania stand which emphasised the new Euro6 engine range with standalone examples of the DC9 9.2-litre and DC13 12.7-litre engines displayed. 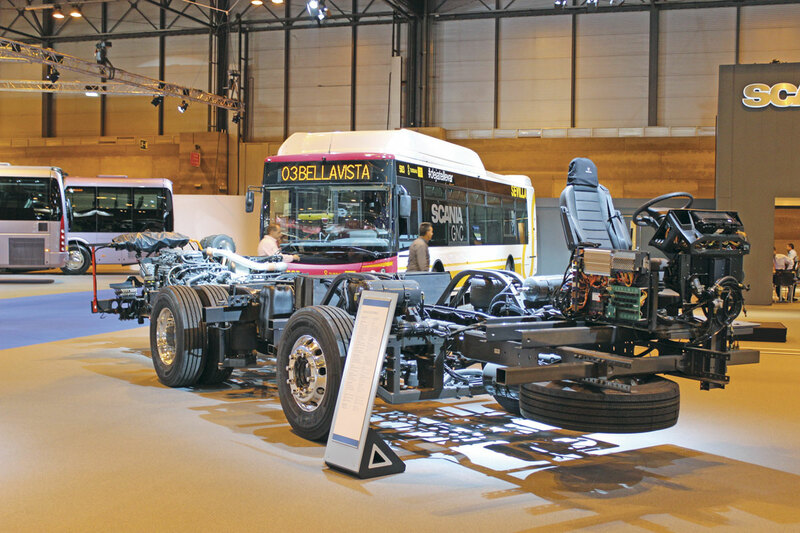 A bare K410EB4x2 chassis was shown as well as a similar chassis with 3.7m high, 12.2m long, Irizar i6 coachwork seating 53 and a Scania Touring HD with 55 seats. The 12.08m Touring HD is bodied in China by Higer. 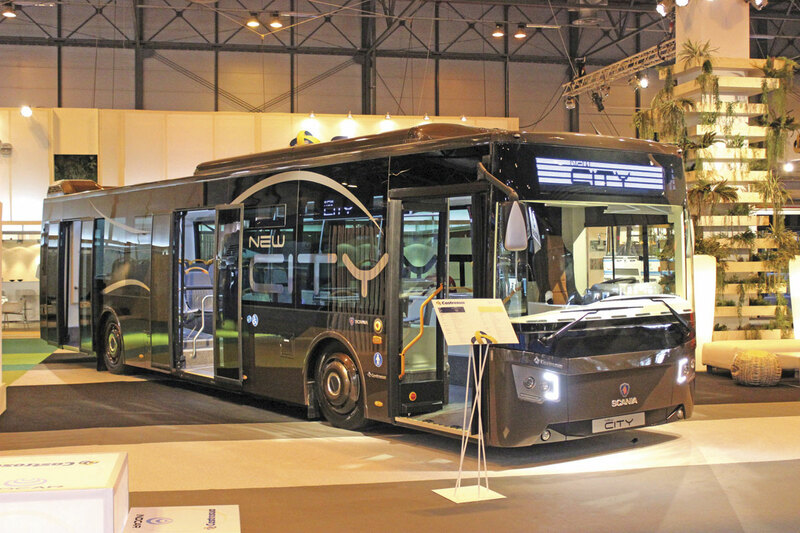 Bus models included the 12m Citywide LE hybrid which uses a parallel system and a 9.2-litre five-cylinder Euro6 engine, and a 12m N280UB4x2 CNG bus with Castrosua City Versus body for 23 seats and 54 standees. There was just the one bus on the Solaris stand, a new Urbino 12 with Cummins engine fresh from a recent series of press demonstrations held by the company in Sitges, a report on which appears elsewhere in this issue. 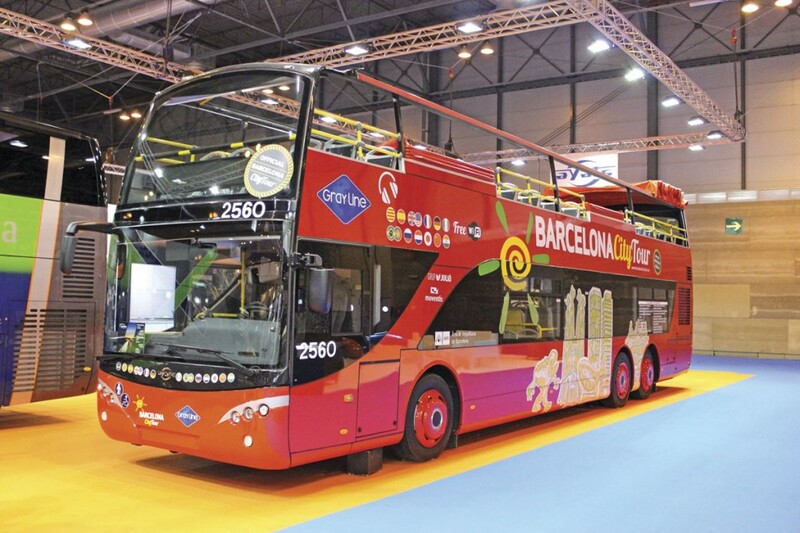 Solaris currently has 27 vehicles in service in Spain, the majority of them working airside, and by coincidence it has the same number of buses on order for delivery in the coming year, among them two Urbino 18 articulated electric buses for TMB Barcelona and five Urbino 12 hybrids for San Sebastian. 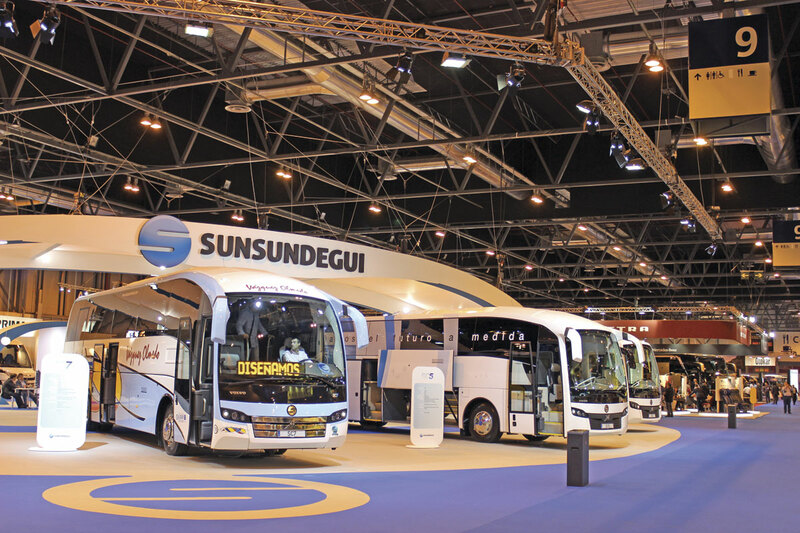 With an imposing stand, Sunsundegui generated plenty of interest launching two new ranges and a new marketing approach focused on the Sunsundegui ‘attitude.’ Efforts in the last couple of years have significantly reduced the company’s break even point and it expects to return a small profit this year producing 250 coaches. Next year’s target is 300. The SC5 is the new 3.5m high stablemate for the 3.7m high SC7 and will be coming to the UK, initially on a reduced length Volvo B8R chassis. The SB3 might sound like a petrol engined Bedford but is actually the 3.3m high replacement for the company’s Astral and is aimed at the intercity and mid range travel segments. An additional low entry version of the SB3 is to be launched next year. Both new models have taken the SC7 as the benchmark and have been designed using a modular concept to enable greater flexibility in meeting operator demands. The new models are both ECE R66.02 compliant, and feature LED lighting and multiplex electrics as well as lane departure warning systems. New interior concepts are designed to be ‘robust’ and a common multiplex system features five modules and a dash screen. Optimisation of the structure means that ULWs are similar despite the additional chassis weight of around 300kg. Luggage capacity was 8.8cu m on the SC5 and optionally 5.8cu m on the SB3. Glazing, including the rear screen is common and there is the option of double or single on the SB3. The SB3 shown was a 13m two door example on a two-axle Volvo B8R Euro6 chassis. It was equipped with a Hidrel Gobel EVO-14 centre door lift and 51 Civic V2 seats and is intentionally more coach-like than its predecessor. Individual light and air units are an option. It was double glazed. The SC5 appeared on a 13m Volvo B11R with 59 seats. It will be offered for all lengths between 10-15m on two and three axles. Completing the display were a 15m tri-axle Volvo B11R SC7 in the colours of ALSA and an SC7 Volvo B11R in the livery of Vazquez Almedo. Unvi waited for the Birmingham Show to unveil its new 8.8m Unvi Voyager coach on the Mercedes-Benz Atego chassis but there was nevertheless lots of news revealed at the company’s Madrid press conference. Most significant is a tie up with the DuraBus concern to start production at a plant in Canada. In a deal that has been two years in the making and preparation, they will run a factory producing converted and built up Sprinter minibuses in the same way that Daimler’s own Dusseldorf plant does. The line-up will be based on the Dusseldorf range adapted for the US and Canadian markets. Fifteen prototypes have already been built in Spain and are being shipped out to Canada where they will be used to train the workforce in the build requirements. A particular focus will be the Canadian tendered market where they are seen as a replacement for ‘Cutaway’ chassis cab and van conversions. Unvi continues to develop its export business with over 50 orders placed recently. In Scandinavia, Unibuss of Lillehammer, Norway, is to take Volvo B7RLE citybuses; BlivaBuss Lingmerths of Linkoping is taking Volvo B7RLE citybuses and the Danish operators Blaa Bussar and Sydtrafik are to take examples on Volvo B8RLE and Volvo B8R. In Dubai it is to supply 20 open top double decks to the DINATA Group for operation by City Sightseeing. They will be on Volvo B7RLE Euro4 powered chassis. Unvi is working with Volvo Hong Kong in Korea where six open top deckers are currently in build for Taeyoung, an operator in the city of Busan. A further interesting double deck deal has seen an Unvi Citytour 40 open top body supplied to Freightliner in the USA on their rear engined XBR chassis which is powered by an EPA13 standard Cummins ISL 330hp engine with Allison Transmission auto gearbox and ZF axles. Spanish home market deliveries include 13 Sprinter citybuses with low rear platforms for Guaguas Municipals in Las Palmas de Gran Canaria and an Urbis bus on an MAN A66 chassis for Osuna. In the past two years Unvi has increased its turnover by 80%, standing at €35m (£27.4m) in 2013. 2014 turnover will be lower as a result of the lack of Euro6 chassis availability and the demise of the Vario which had accounted for 50% of business. The very last Vario they will body is currently being completed for an Italian customer. On the stand were four vehicles: a 29-seat Compa T coach on a new Daily 70C17, an extended Sprinter Vega XL with 22 seats, a Vega GT Sprinter with 19 seats and a Cimo T with 37 seats on an MAN N14 chassis. The emphasis on the Volvo stand was on the bus side and particularly alternative drive systems. One of the three prototype 7900 plug-in hybrids operated in service during a trial in Gothenburg was shown with a charging station alongside a Euro6 three-door 7900LH Hybrid for Malaga. 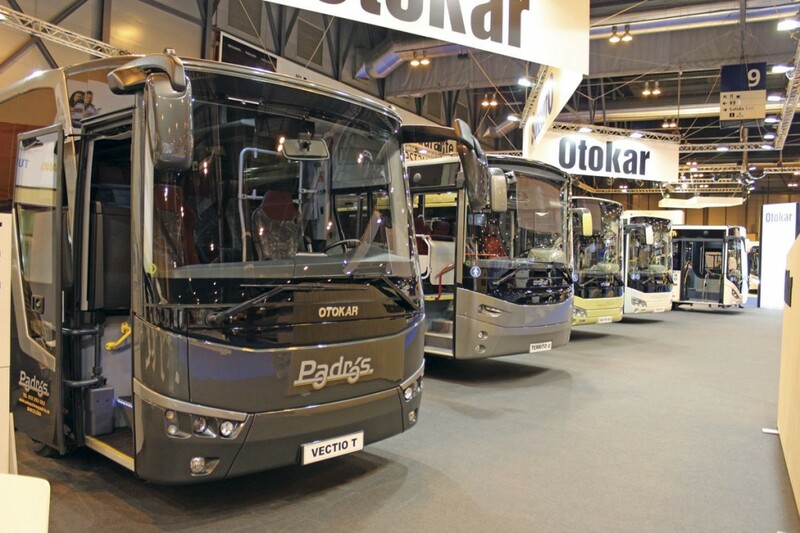 The chassis mounted exhibits included a 14.9m Irizar i3 low entry 55-seat bus on a B8RLE with 350hp D8K engine and ZF AP1400B transmission supplied to CRTM with a contract maintenance and driver training package. 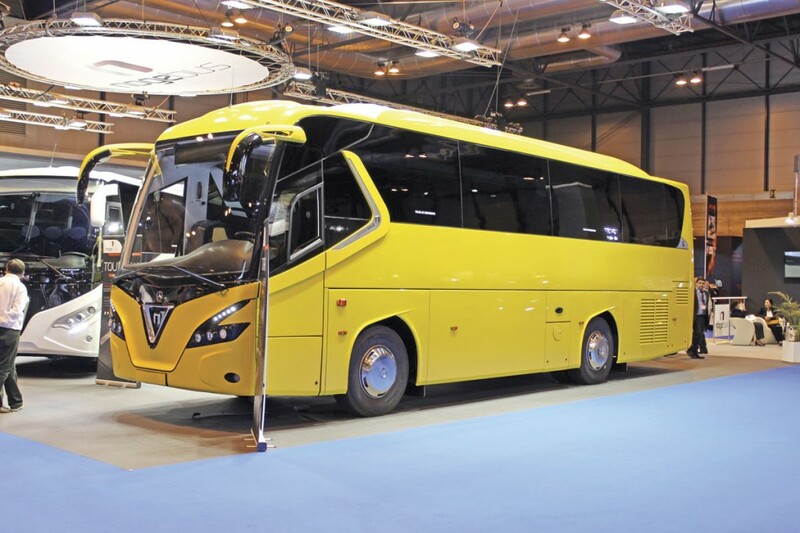 A coach exhibit was a 15m B11R tri-axle Sunsundegui SC7 for Francsico Larrea with 71 seats and courier or 63 seats, two wheelchairs and courier. It had the 460hp D11K engine. Autobusy had by far the noisiest stand and at times it was difficult to hold conversations on adjacent stands. They showed four highly specified Sprinters from their range, all painted black. Integralia showed a variety of Sprinter based conversions in matt metallic colour schemes including the IN-Urban bus, the IN-VIP and the IN-Tourism coach. The company has recently become a recognised Mercedes-Benz Van Partner, recognising the quality of its work. Attracting a great deal of attention was a display of six historic buses and coaches that had operated in Spain. Four were owned by the operator, Continental Auto, among them the two oldest exhibits, a 1914 Model T Ford with 17 seats and four-cylinder 2,900cc engine and an altogether heavier duty 1922 Hispano Suiza 30/40 seating 18 with double rear wheels and four cylinder 4,710cc engine. Belonging to Julian de Castro was a 1934 Hispano Suiza T69 with Barreiros EB-4 four-cylinder engine and 33 seats. Two others from the Continental Auto stable were a 1935 Bussing with Burglowe body seating 16 and a 1941 MAN 41 seater with 9,498cc D2040 engine. Completing the display was the newest of the exhibits at only 61 years, a 1953 Mercedes-Benz 0.3500 with 4,580cc OM312 engine and 23 seats in the colours of Don Juan Antonio Matary a Legaria. The FIAA event has always had a character of its own and despite the extremely difficult times the Spanish market has been through, and to a not inconsiderable degree is still suffering, this year’s show suggested there may be more resilience in the country’s broad bus and coach manufacturing base than looked likely a couple of years ago. There have been casualties and it was sad not to see the Tata Hispano brand which has disappeared since the last FIAA, though Noge, which had appeared doomed, was present with new models. Most internationally based builders have always looked to have solid long term futures and the various new products, restructurings and marketing agreements among Spain’s more traditional players are all signs of fight. Against this, there is a slow and continuing trend towards the major international manufacturers selling complete integrals rather than chassis though the body and chassis markets remain important to most of them. Other players, such as Solaris, Otokar and King Long, mainly offering integrals, are also finding niches. There are some parallels with the UK in this. As in the UK, there is a full spread of technology demand from derogated Euro5 at one end to full electric at the other. Predictions that this would be a dull show with little new after the IAA and various more localised national exhibitions proved somewhat wide of the mark.